Meningitis comes with a fever, stiff neck and headache; get attention now. A bacterial or viral infection should always be considered in the patient with a stiff neck and headache, simply because it is so serious. Not many patients with infectious illnesses appear in the chiropractor's office, because this patient is sick. It's a highly contagious disease, so the doctor is also at risk. In hospital the patient will be immediately be placed in isolation. Because we chiropractors treat so many patients with headache, this is a rare but very serious disease that we should keep in the back of our minds whenever treating the patient with a headache and stiff neck. This is not the typical stiff neck where you can't turn your head to the side, but flexing the head onto the chest is very painful and severely restricted. The classic test of Kernig is done with the patient lying on their back, with the hips and knees bent in the so called 90 stroke 90 position. If someone supports your thighs, and straightens your knees, and it causes neck pain, then it's definitely time to get to hospital. Not to your doctor, nor to your chiropractor. Do not pass GO, do not collect $200, GO STRAIGHT TO THE HOSPITAL. Remember this illness may be highly infectious. Your family and acquaintances should immediately be alerted. The condition may be viral or bacterial. In the latter a rash is common. Meningitis is a medical emergency. Don't mess around with Chiropractic Help! Severe headache is the most common symptom (87%) followed by neck stiffness 83%. altered mental status. This patient is Sick! with a capital S.
JOHANNESBURG. The Natal Witness, 25th May, 2010. Tenor Siphiwo Ntshebe, who was to sing Hope at the World Football Cup opening ceremony, died in Port Elizabeth on Tuesday, his record company announced yesterday. Within a week of realising his dreams of performing at the opening of the WFC he was struck down with the meningitis bug. It's a great sadness, said Sony's chief executive officer, Keith Lister. Ntshebe, aged only thirty four, and dubbed South Africa's new Pavarotti had just finished recording an album when he was smitten by the bacterial meningitis bug. A Sony spokesman said the Hope recording was still on the official WFC program. They hadn't yet decided what to do about Siphiwo's album. Here's a tidbit from the chiropractic coalface. For years I had a weekly date with a good friend at the squash court. He has a spondylolysthesis, a low back condition that required occasional visits to my couch. We knocked a few kilos off after work, added a few more back with a couple beers, and generally shot the breeze. We were also both BMW motorcycle fans, and enjoyed a few rides together. One day he didn't arrive for our match. It was not like him. He phoned the next day to apologise, telling me his better half was in hospital with a very stiff neck. In hospital? Why not in my office? I asked foolishly. She died three days later. A teacher, she caught the bug from a child who survived. Has your child or partner got a headache, stiff neck, high temperature and isconfused? Don't mess with it. These layers of tissues are the meninges that form the covering of the brain and spinal cord. 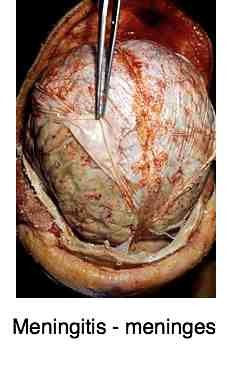 Here you can see them peeled back during an autopsy of a patient who died from meningitis. Can you see the little bleeds where blood vessels have ruptured? This patient certainly had head neck pain. The meninges extend from the brain right down to the low back, covering the brain and spinal cord. That is why in Kernig's test, straightening the legs stretches the meninges and reproduces the neck pain. In a slipped disk in the lower back something similar happens, but without the infection. If flexing your head forward onto your chest causes low back pain, you have no fever or stiff neck, then make an appointment today with your chiropractor. "Let me tell you the secret that has led me to my goal. My strength lies in my tenacity." Vaccinations remain a vexed subject in the Chiropractic profession, and I confess I have no strong opinion. That they sometimes cause death and disability is beyond debate. Just recently three healthy babies in the Netherlands died in one week, within ten days of having a vaccination against meningitis. However vaccinations also save many lives and we live today in a world without small pox thanks to Louis Pasteur. Headache and a fever? This is probably not headache chiropractic. Stiff neck with it? Get to the emergency rooms NOW. Two of the symptoms of meningitis are an every day finding at the Chiropractic Coalface; namely neck pain and headache. The difference is the high temperature and that it's neck flexion that is particularly limited which is a less common finding. Errors of judgement are often made when a disease is not yet in its full blown state. In this case, when the patient has only a slightly raised temerature, perhaps. HELENS 15 EURO SALAD ... the cure for my terrible constipation. BROCCOLI FACTS ... the best anti oxidant out there. COOKING GREEN BEANS ... and growing them too. Try and replace some of your animal protein bit by bit with legumes. The sudden death of my friend's wife certainly shocked me, and her death in some ways never left me. One of those ongoing life's reflections. Ultimately, I decided to use her story in my fourth book, now pending. Santie Veenstra, only twelve years old, suddenly loses her mother to meningitis with tragic consequences for her life. Until she meets Janet Twycross. 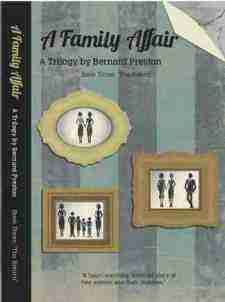 Actually it's a trilogy, and the first book you can sample for free at A Family Affair. It's a bit shocking; get ready to be challenged.